Wax from the previous basket that I would repurchase include: Rosegirls Snowflake and Better Homes and Gardens Soft Cashmere Amber. So I finally did myself a favor and watched Sherlock. I also did myself a huge disservice by starting it without time to spare, so I only got to watch the first 30 minutes of Season 1, Episode 1. Torture. Cliffhanger. Obsessed. Please help. Must have more Sherlock. Anyone else Sherlocked? Sherlockian? Holmie? I also picked up a cat cardigan at Target yesterday, providing one of my sisters with a good chuckle. Hey, I am a teacher. And a geek. I will wear cat cardigans all day long. You are going to rock that kitty cardigan. Wood violets and sugar maple --now that's a blend I would have never thought of --I'm glad you wrote the added note from the previous melt because I couldn't wrap my brain around this one. 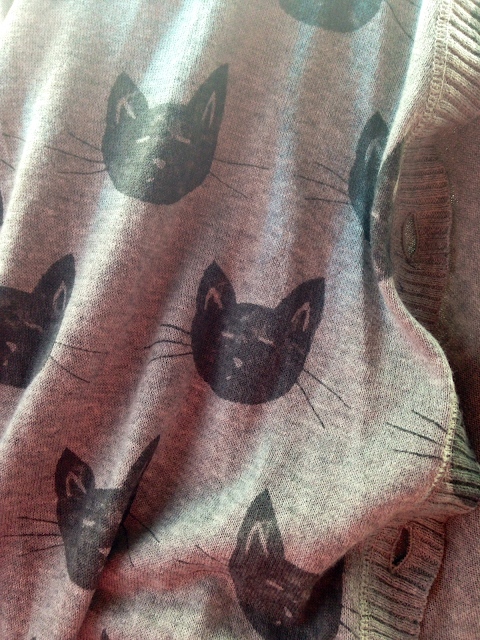 I wore the kitty cardi to IKEA yesterday <3 I didn't buy anything but my sister got a few knickknacks. Wood violet is different. Very dry, dusty old books vibe going on. I like it but I could not melt it all the time. I think half a tart would have sufficed. Hope you have a good day Sunnee! My break has been cut short. I have to return to work tomorrow. Zucchini Cookie Bakery sounds phenomenal! I really like the way you handle your wax basket. I have one that I just toss things into that I want to melt *eventually*, and guess how often I go in there? Yep, almost never, hah! Maybe this weekend I will make it a point to reconfigure! The zucchini one was so yummy. I used up that 4 pack before I could turn around. I am liking the basket method. I do occasionally melt something not in the basket if I want to review a new vendor but I pretty much stick to it. It helps that my basket sits on the dresser and my wax storage is tucked away in my closet. Easy to reach the basket. Next up is lots of apple blends. 💗 mmmmm!!! Hope you are having a fantastic Friday Julie! You melted some yummy wax! I like your cat cardigan.